WHO CAN FIGHT AGAINST RED CHINA? Posted byWholeDude	 July 24, 2015 October 14, 2015 Leave a comment on WHO CAN FIGHT AGAINST RED CHINA? If United States is not “NEUTRAL” in South China Sea Disputes, it demands action to join the dispute for its complete resolution. Red China is unwilling to settle her territorial dispute with Tibet and the same unwillingness is clearly displayed in her attitude that is manifested as South China Sea Disputes. Red China has become very assertive and is very confident of her military and economic power. Red China ignores pronouncements made by diplomats for she truly believes that no one can fight against her. At Special Frontier Force, we express a willingness, a readiness, a preparedness to fight against Red China for we think that is the right thing to do and for we believe it is ‘The Battle of Right Against Might’. 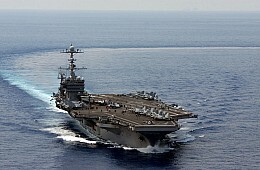 The Nimitz-class aircraft carrier USS George Washington underway in the South China Sea. America’s top diplomat for East Asia clarifies the country’s outlook in a keynote speech. “We are not neutral when it comes to adhering to international law. We will come down forcefully when it comes to following the rules,” Russel said during a keynote speech delivered at the Center for Strategic and International Studies. In this vein, Russel said in his speech that the United States was currently encouraging relevant parties in the South China Sea to create the atmosphere and conditions necessary to manage the disputes peacefully, diplomatically and lawfully despite escalating tensions there partly caused by China’s assertive actions. “We’re pushing the parties to revive the spirit of cooperation,” Russel said. The focus, Russel said, would be on lowering the temperature and creating the breathing room necessary to pursue peaceful paths toward resolving disputes, such as negotiations and arbitration. He encouraged all actors – not just China – to cease actions that run contrary to this spirit, including reclaiming land, building facilities and militarizing features. Beijing has been engaging in an extensive land reclamation activities in the South China Sea to the alarm of claimants and outside actors. Russel said that U.S. Secretary of State John Kerry would push for progress on this front at the upcoming ASEAN Regional Forum, which will be held next month in Malaysia, this year’s chair of the Association of Southeast Asian Nations. “He’ll push for progress. This is an important priority,” Russel said. On the first peaceful path to resolving disputes – bilateral negotiations – Russel acknowledged it was challenging to pursue this course under the current atmosphere. While not directly mentioning China by name, he noted that “absolutist” statements by certain countries that their claims were “indisputable” made going down this path even more challenging. But he also said that there were several cases in the region where this had worked, including between Indonesia and the Philippines, Malaysia and Singapore, and Bangladesh and Myanmar. “Hey, it can be done,” Russel argued. On the second path – arbitration – Russel specifically referenced the Philippines ongoing case against China at the United Nations Permanent Court of Arbitration at The Hague. He stressed that regardless of the outcome, both Beijing and Manila had to abide by the court’s legally binding decision as they were both signatories to the United Nations Convention on the Law of the Sea (UNCLOS). “In keeping with the law, both China and the Philippines are obligated to follow the decision whether they like it or not,” Russel said. In the meantime, Russel said that the United States would safeguard its own interests in various ways, including honoring its alliances and security commitments and aiding the development of effective regional organizations. This included taking steps such as investing in maritime domain awareness for coastal states and carrying out freedom of navigation operations in the South China Sea. “We the United States are obligated to protect U.S. interests,” Russel said. Summarizing the essence of the U.S. position on the South China Sea disputes, Russel reiterated that it was not about rocks but about rules for the Asia-Pacific region. “It’s really not about the rocks and the shoals. It’s about rules. It’s about the kind of neighborhood we all want to live in,” he said. Posted byWholeDude July 24, 2015 October 14, 2015 Posted inRED CHINA -The Expansionist, Red China-Whole VillainTags: Who can Fight against Red China?